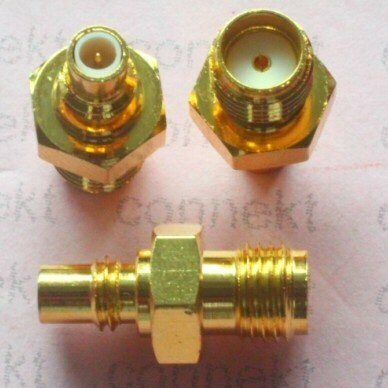 Below is a photo of an SMC to SMA adapter you could buy on Ebay. ...that looks similar to our connector chart but contains even more connector species. Imitation is the sincerest form of flattery! On an SMC connector the male center conductor is called a female (jack) connector, backwards of SMA. What genius thought that was a good idea?